I’m happy to announce the release of the 2017 State of the Services Economy Report that I worked on for the past six months with Mavenlink, one of the best reports I worked on in the past several years. Visit this page to download the full report. I co-authored the report with Ray Grainger, the CEO of Mavenlink. We were supported by a great team, and supported by ResearchNow. We also had great contributions from my research panel: David Coleman, Steven Fisher, Martin Gaedke, Maddie Grant, Jean Russell, Brian Solis, and Joachim Stroh. We started with some core premises for the research. 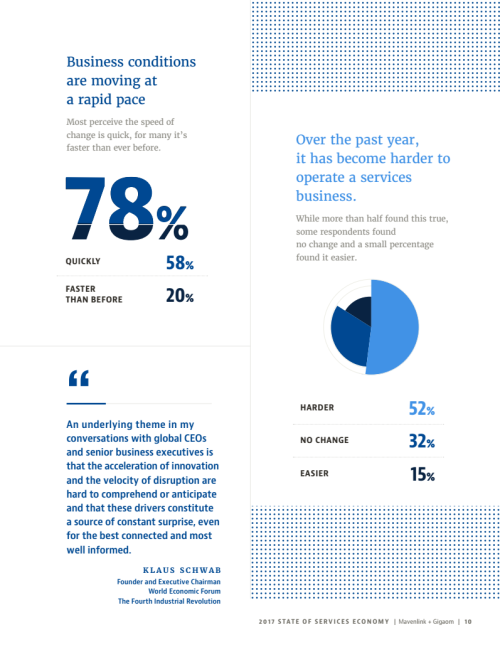 We believed that the rate of change in the service economy was very steep, and that turned out to be the case: Over three quarters (78.3%) of our survey’s respondents state business conditions are changing quickly, and 20% say it’s faster than ever before. This sets the deep background for everything else discussed in the report: an unrelenting pressure to adapt to a rapidly changing business context, one that — at least for some — is changing as quickly as it ever has. 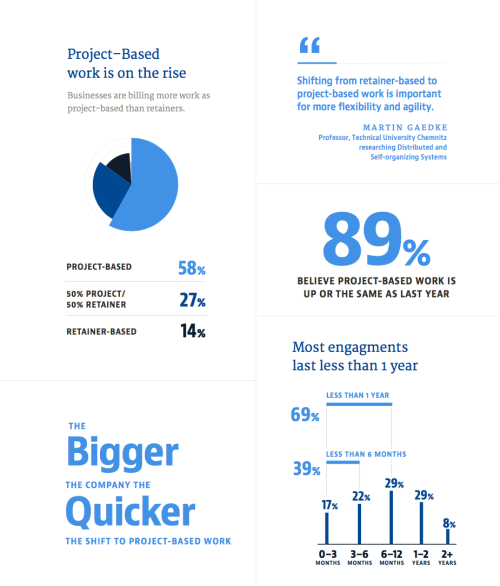 A major trend in services companies is the rapid transition to project-based work, away from retainer-based models, and the bigger the company, the quicker the transition. This transition seems tightly linked to the need for greater agility and flexibility by services companies’ clients. We expected that the best defense against the onslaught of technology-induced change would be… more technology. 70% of those surveyed say they are adopting new technologies, and only a small group are holding out against new technologies. The third big bang from the research has to do with competition. Times of great change can lead to increases in the level of competition, and our survey confirmed that. 36.6% say it’s a combination of the two. That means the greatest competitive threat is coming from new entrants, in general. So, the hard bottom line: accelerating change, transition to project-based economics, more defensive and offensive technology, and more competition. Welcome to the accelerating services economy. This research was sponsored by Mavenlink, but the opinions stated are my own. Originally published at www.stoweboyd.com.